Home > April 2016 > Aerosol April Fools! Aerosol cheese is seldom funny…. These days, a small town of 3,500 could consider itself lucky just to have a place that sells milk and eggs. So the feisty, cosmopolitan town of Yellow Springs, OH could view itself extraordinarily fortunate to harbor a store that strives to cater to its demanding, world-wise palate. But deep down, Yellow Springers are still, well, midwesterners. And no one knows this better than Tom Gray, owner of that eponymous epicurean establishment, Tom’s. While Gray has seen to it that villagers can choose from 16 different types of olives, organic vegetables and raw juices, he still gets the furtive, yet not-so-infrequent requests for pop-top weenies-in-a-can and tropical red punch. Enter modern food science to the rescue. 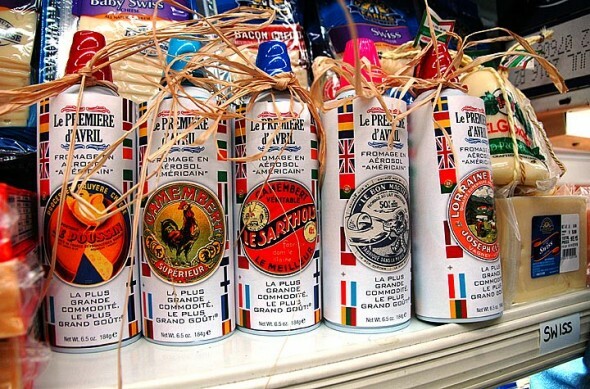 At a food fair in Chicago last June, Gray discovered the perfect compromise product, Le Première d’Avril Artisan Aerosol Cheeses, which he intends to shelve later this month. The aerosol cheeses are the brainchild of AliGaz, a Franco-American food company which sees a market in a new generation of consumers who were raised by yuppies and have developed a taste for the finer things in life, yet who tend to push back against their entitled upbringing by “ironically liking” classic American convenience products such as brightly colored spray cheese. “Currently, AliGaz offers only a handful of aerosol cheeses,” Gray said. “Camembert, creamy lorraine, gruyère, and a traditional Roquefort — though that last one is not really ready for prime time yet,” he adds. Gray explains that while the tangy cheese would likely be a high-demand item, the crumbly texture doesn’t fare well when forced through a narrow nozzle at high pressure. Le Première d’Avril Artisan Aerosol Cheeses will initially be stocked in the deli with the bulk cheeses, but will eventually be located with other pre-packaged cheeses and dairy items. “Just look for the raffia; no other spray cheese has that,” Gray said.